Among those leading the charge in this combative and politically engaged approach to philosophy was Otto Neurath (1882-1945). In the Circle’s internal debates he advocated a radical naturalistic epistemology, centred around a progressively refined form of our everyday language. His radicalism led him to denounce as ‘metaphysics’ even some theories — too abstract for his liking — that were espoused within the Circle itself (see, e.g., Reisch 2005:8; Cartwright et al. 1996:5-6). With his various political activities, he contributed greatly to marking out a place for the Circle in the contemporary political landscape (see chapter 10 of Haller 1993; Cartwright et al 1996). At the confluence of Neurath’s philosophical and political endeavours lay his project Isotype, a system of diagrammatic representation, originally designed to convey statistical information, but which in later years came to be marketed as an ‘international picture language’. Neurath’s epistemology and his accompanying commitment to everyday language were part of his doctrine of ‘physicalism’, which he developed in discussions conducted principally with his fellow Circle member Rudolf Carnap (1891-1970). At heart physicalism hinges on the possibility of translation: what distinguishes a scientifically valid statement from a meaningless statement of metaphysics is that the scientific statement can be translated into a language that describes everyday phenomenal experience. The statement of experience can then be confirmed or disconfirmed, a possibility not available to the untranslatable metaphysical statements. This principle of intertranslatability allows further for the ‘unity of science’, the free co-operation and communication among scientists, breaking down the disciplinary boundaries that presently separate them, a goal that Neurath (e.g., 1983:48) first proposed and which achieved currency within the Circle. 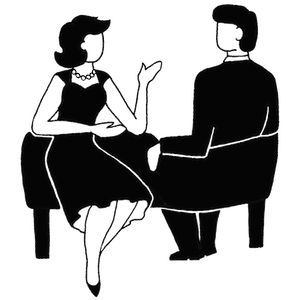 The discussions in which Neurath and Carnap developed and refined physicalism are known collectively as the ‘protocol sentence debate’, named after the ‘protocol sentences’ in which observations are recorded, as in a scientist’s ‘protocol’ of their experiment (see Uebel 2007). Neurath drove the debate with his objections to the prevailing epistemological views in the Circle, which closely followed the evolving teachings of Ludwig Wittgenstein (1889-1951; see chapter 4 of Uebel 2007; Carus 2007:239-251). In order to understand Neurath’s physicalism, it is necessary to contrast it to Carnap’s conception. At the centre of Carnap’s (1934) version of the theory lies the ‘physical language’. This is indeed the language of the scientific discipline of physics, although not necessarily in the form it has today or in the form it has had in any historical period (Carnap 1934:54). The defining property of this language is that it talks objectively about physical entities in the world in quantitative terms (ibid.:52-67). That is, it talks of goings on in the world in a mathematically precise way independent of the perceptions of any individual. It is possible to verify any statement of this physical language by translating it into a ‘protocol language’, an idealised language that directly records the experiences of an individual observer. There are as many protocol languages as there are observers. Carnap took the physical language as his basis for two reasons. First, it is objective, or rather inter-subjective. That is, it talks about the world in absolute terms, divorced from the perspective of any single speaker. This is in contrast to the protocol languages, each of which refers to the private experience of the individual and so is not available for public discussion. Second, so claimed Carnap, every statement in every scientifically valid language can be translated into the physical language. Statements in any of the ‘sub-languages’ of chemistry, biology, psychology, sociology and so on — that is, in any of the genuine sciences — can all be translated into the physical language (Carnap 1934:67-74). But not every statement in the physical language can be translated into one of the sub-languages. The physical statement may deal with a subject matter that lies outside the scope of any given sub-language: a statement that could be translated into chemical terms may not be translatable into sociological terms, for example. It is this possibility of translating any statement from the sub-languages into the physical language that makes it the ‘universal language’ that guarantees the ‘unity of science’ as a single undertaking, and simultaneously excludes everything that is not scientific — these are the constructive and exclusionary sides of the scientific world conception (ibid.:96). There is no way to establish fully secured, neat protocol statements as starting points of the sciences. There is no tabula rasa. We are like sailors who have to rebuild their ship on the open sea, without ever being able to dismantle it in dry-dock and reconstruct it from the best components. Only metaphysics can disappear without trace. Imprecise ‘verbal clusters’ [‘Ballungen’] are somehow always part of the ship. If imprecision is diminished at one place, it may well re-appear at another place to a strong degree. There were several routes that Neurath took to developing his universal jargon. On a purely linguistic level, he compiled an Index Verborum Prohibitorum of forbidden terms that are unavoidably burdened with metaphysical assumptions (see Reisch 1997; the name is of course a pun on the Index Librorum Prohibitorum of the Catholic Church). But at the same time his system of picture statistics, or Isotype, as it came to be known, was also drawn into this project. 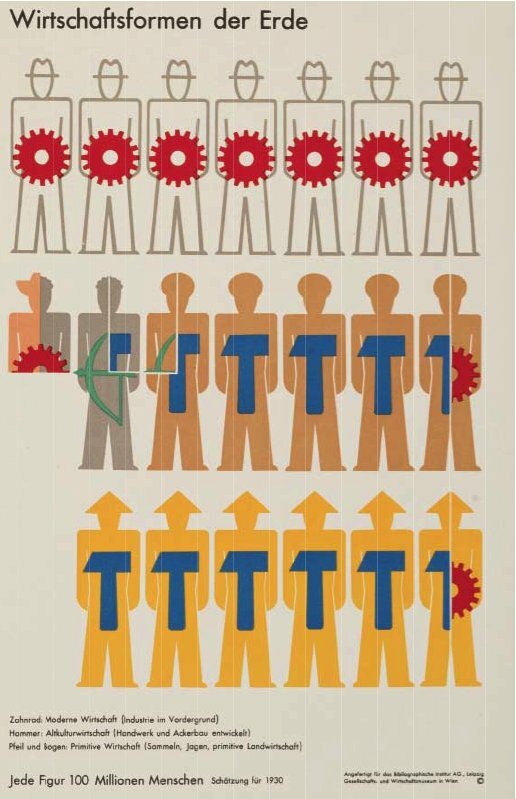 Isotype was a direct product of Neurath’s efforts to fashion tools of thought for improving everyday life. He initially developed it at the Kriegswirtschaftsmuseum (Museum of War Economy) in Leipzig during the First World War in order to illustrate to a lay audience the workings of the war economy (see Schumann 1973; Carwright et al 1996:20). In Vienna, after the war, it reached new heights of sophistication at the Gesellschafts- und Wirtschaftsmuseum (Museum of Society and Economy), which was founded to explain the economic and social policies of the socialist government of ‘Red Vienna’ to the average citizen (see Neurath 1991; 1991).2 The system became a top intellectual export product, with the lending of exhibits to museums overseas and the establishment of branch museums in Berlin, the Hague, London and Moscow. A typical example of the system from this period can be see in Figure 1 below, which illustrates the different types of economies found in the world and their distribution over various population groups, with their sizes. The toothed wheel represents modern industrial economies, the hammer economies based around skilled trades and agriculture, and the bow and arrow hunter and gatherer economies with primitive agriculture. Each figure represents 100 million people: the outlined figures with hats represent Europeans; the brown figures with turbans represent ‘orientals’, Indians and Malays; the black figures Africans and ‘mulattoes’; and the yellow figures with pointed hats represent ‘Mongols’. During the 1930s, Neurath developed his picture statistics to deal with an ever wider range of material, going beyond the purely statistical to cover historical narrative and procedural instructions (e.g. Neurath 1936:55; 1939). At the same time the system acquired the name ‘Isotype’ — ‘International System of Typographic Picture Education’ (see Neurath and Kinross 2009) — with the additional epithet ‘international picture language’. It is not entirely clear what lay behind the new designation: even as he introduced the ‘international picture language’, Neurath was careful to point out that ‘[t]here are simple picture languages in which no other sorts of signs are used. What we have to do with here, however, is a picture language which is not able to give the story by itself, but only with the help of the words of a normal language’ (Neurath 1936:16; Neurath and Kinross 2009:49 make a similar point). Among later commentators, there are those, such as Müller (1991), who take the designation ‘picture language’ quite literally and examine it in light of the linguistic theories current in Neurath’s milieu; others, such as Burke (2011), dispute that Neurath ever thought of Isotype as a linguistic system, despite the rhetoric that suggests as much. Neurath spoke of the individual symbols as the ‘vocabulary’ of the system and the method of their combination as the ‘grammar’, although he always maintained a distance from the implications of linguistic status these terms carry (see Neurath 1936:56). What a triumph it was when people freed themselves from the limits of pictographic writing, what a triumph, when language adapted itself flexibly and in multiple forms to the demands of scientific work, when people learnt to master this logical tool. Of course, liberation from the picture led also to diversions, led into the realm of the meaningless. Nominalisation created new problems. In particular the German language leads to such metaphysical diversions; it allows numerous statements about ‘the nothing that nothings’ (Heidegger), about the ‘being’ — as if the ‘being’ could be used in a sentence like the sword or the table. The pure pictographic writing recognises a sword and a table, but no being. Here we see Neurath reiterate Carnap’s (1959:69-73) well-known elevation of Heidegger to a paradigmatic example of metaphysical nonsense (but cf. Friedman 2000). ‘Words divide, pictures unite’, first attested in German as ‘Worte trennen — Bilder verbinden’ (Neurath 1991:273) is Neurath’s repeated slogan for Isotype. It echoes his call for unified science, ‘Metaphysical terms divide — scientific terms unite‘ (Neurath 1987:23, emphasis original; see also Haller 1993:175-176; Cartwright et al 1996:179), and in so doing classes ‘words’ with ‘metaphysical terms’ and ‘pictures’ with ‘scientific terms’. On a purely theoretical level, pictures appealed to Neurath as the basis of a system of communication, especially of scientific communication, because of what he saw as their inherent connectedness to the world. This attitude of Neurath’s can be seen as an extension of his search for a ‘universal jargon’ fashioned from our ‘trivial language’ by eliminating ‘metaphysical’ terms and holding onto those that are ‘scientific’ because they can be directly related to our concrete experience. This post is derived in part from McElvenny (forthcoming). 1 The complete sentence reads in the original: ‘Der Wiener Kreis glaubt durch seine Arbeit im Verein Ernst Mach eine Forderung des Tages zu erfüllen: Es gilt, Denkwerkzeuge für den Alltag zu formen, für den Alltag der Gelehrten, aber auch für den Alltag aller, die an der bewußten Lebensgestaltung irgendwie mitarbeiten.’ An idiomatic English translation that does not quite capture the central place of the word Alltag in this quotation can be found in Neurath and Cohen (1973:305). See Uebel (2008) for a detailed account of the Circle’s manifesto. 2 The principles of Neurath’s system and the ideas that lie behind them are recorded in numerous publications by Neurath. Most of these are collected in Haller and Kinross (1991). Neurath’s earliest essay in which the basics of the method can be recognised comes from 1925, shortly after the founding of the Vienna Gesellschafts- und Wirtschaftsmuseum (Neurath 1991). Neurath (1991) and (1936) describe the system in detail. Neurath (1996) gives a thorough philosophical and pedagogical justification for the system, and Neurath (2010), his ‘visual autobiography’, tells the story of the development of the system from the perspective of his personal history. An example of the system in action can be found in Gesellschaft und Wirtschaft (Gesellschafts- und Wirtschaftsmuseum 1930), which contains reproductions from the original exhibits in the Vienna museum. See further the bibliography of Marie Neurath and Kinross (2009). The Gerd Arntz web archive, a website dedicated to the artist who contributed most to defining the visual style of Isotype, contains many examples of Isotype images. Burke, Christopher. 2011. ‘The Linguistic Status of Isotype’, in Image and imaging in philosophy, science and the arts, vol. 2, edited by Richard Heinrich, Elisabeth Nemeth, Wolfram Pichler, David Wagner, 31-57. Frankfurt: Ontos Verlag, 2011. Cartwright, Nancy, Jordi Cat, Lola Fleck and Thomas E. Uebel. 1996. Otto Neurath: philosophy between science and politics. Cambridge: Cambridge University Press. Carus, A.W. 2007. Carnap and twentieth-century thought. Cambridge: Cambridge University Press. Cohen, Robert S. and Marie Neurath. 1983. Otto Neurath: philosophical papers 1913-1946. Dordrecht: Reidel. Friedmann, Michael. 2000. A Parting of the Ways: Carnap, Cassirer and Heidegger. Chicago: Open Court. Gesellschafts- und Wirtschaftsmuseum Wien. 1930. Gesellschaft und Wirtschaft: bildstatistisches Elementarwerk. Leipzig: Bibliographisches Institut. Haller, Rudolf. 1993. Neopositivismus. Eine historische Einführung in die Philosophie des Wiener Kreises. Darmstadt: Wissenschaftliche Buchgesellschaft. Haller, Rudolf and Robin Kinross, eds. 1991. Otto Neurath: Gesammelte bildpädagogische Schriften. Vienna: Hölder-Pichler-Tempsky. McElvenny, James. Forthcoming. ‘International Language and the Everyday: contact and collaboration between C.K. Ogden, Rudolf Carnap and Otto Neurath’. British Journal for the History of Philosophy. McGuinness, Brian, ed. 1987. Unified Science: the Vienna Circle monograph series originally edited by Otto Neurath, now in an English edition. Dordrecht: D. Reidel. Müller, Karl H. 1991. ‘Neurath’s theory of pictorial-statistical representation’, in Rediscovering the Forgotten Vienna Circle: Austrian studies on Otto Neurath and the Vienna Circle, edited by Thomas E. Uebel, 223-251. Dordrecht: Kluwer. Neurath, Marie und Robert S. Cohen, eds. 1973. Empiricism and Sociology. Dordrecht: Reidel. Neurath, Marie and Robin Kinross. 2009. The Transformer: principles of making Isotype charts London: Hyphen Press. ————. 1936. Isotype: international picture language. London: Kegan Paul. ————. 1939. Modern Man in the Making. New York: Knopf. ————. 1983. ‘Protocol Statements’, in Cohen and Neurath (1983:91-99) (Translation by Robert Cohen of ‘Protokollsätze’. Erkenntnis 3:204-214). ————. 1991. ‘Gesellschafts- und Wirtschaftsmuseum in Wien’, in Haller and Kinross (1991:1-17). (Original in Österreichische Gemeindezeitung 2.16:1-155). ————. 1996. ‘Visual education: humanisation versus popularisation’, in Encyclopedia and Utopia: The life and work of Otto Neurath (1882-1945), edited by Elisabeth Nemeth and Friedrich Stadler, 245-335. Dordrecht: Kluwer. ————. From Hieroglyphics to Isotype: a visual autobiography. London: Hyphen Press. logic. Cambridge: Cambridge University Press. Schumann, Wolfgang. 1973. ‘Memories of Otto Neurath’, in Neurath und Cohen (1973:15-18). Uebel, Thomas. 2007. Empiricism at the Crossroads. The Vienna Circle’s Protocol Sentence Debate. Chicago: Open Court. ————. ‘On the production, history, and aspects of the reception of the Vienna Circle’s manifesto’. Perspectives on Science 16.1:70-102. Verein Ernst Mach. 2006. ‘Wissenschaftliche Weltauffassung: der Wiener Kreis’, in Wiener Kreis, edited by Michael Stöltzner and Thomas E. Uebel, 1-29. Hamburg: Felix Meiner Verlag. (Original published Vienna: Artur Wolf).